The strawberry belongs to the same family as the rose (Rosacea) and is one of nature’s most succulent, sweet and healthy fruits. It may be the third most popular ice cream flavour (trailing chocolate and vanilla), but it’s second to none when it comes to fresh berries. Technically it’s not a true berry, because it has its dry, yellow seeds on the outside. True berries, such as blueberries and cranberries, have seeds on the inside. Wild strawberries have been eaten and used in medicines since antiquity, but the hybrid species we enjoy today was cultivated in France in the 18th century. 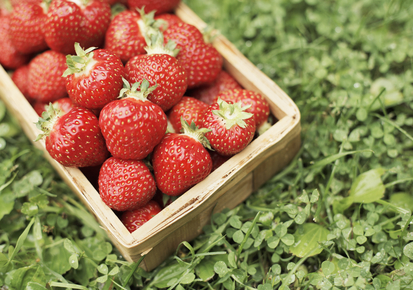 Fresh strawberries are particularly high in soluble fibre, which is the type that dissolves in water. Most of us are familiar with psyllium husk, which is an insoluble fibre. Insoluble fibres are important because they add bulk to the diet and help prevent constipation. But they pass through the gastrointestinal tract in their original form. By contrast, soluble fibers attract water and form a gel, which slows down digestion and delays the emptying of your stomach. That makes you feel full and helps control your appetite, and therefore your weight. When your stomach empties slower, your blood sugar levels are more ideal, too. Soluble fibre can even help lower LDL cholesterol. Strawberries are high in vitamin C, folic acid, potassium and many powerful antioxidants. It has anti-inflammatory properties (providing you’re not allergic) and may also help iron absorption. Studies show that regular consumption of strawberries may even reduce the risk of colorectal cancer thanks to the anthocyanins, ellagic acid and other polyphenols they contain. These same compounds might also slow the effects of aging on the nervous system and help protect against the damage typical of Alzheimer’s and other neurodegenerative diseases.